(Left to right) Students Keiko Tsuboi, Matt Zimmer and Henry Manning lead participants in the walkout down H Street toward the Farragut North Metro station, where they then traveled to the Capitol. Updated: Nov. 9, 2017 at 9:30 p.m.
At least three students were arrested at a rally on Capitol Hill Thursday protesting the end of a program that shielded young undocumented immigrants from deportation. The rally, which attracted more than 500 demonstrators, came after students from schools across the D.C. area – including GW – marched out of classes in opposition to the Trump administration’s decision to end Deferred Action for Childhood Arrivals. The program, enacted during the Obama-era, gave temporary legal status to young undocumented immigrants brought to the United States as children, a group known as Dreamers. Seniors Henry Manning and Keiko Tsuboi and sophomore Liz Burkemper were among 15 people restrained with zip ties and arrested by Capitol Police at the rally, Karen Lopez, a sophomore and the communications director for the walkout, said. She said police told the group to stop chanting and the students were arrested when they didn’t comply. “Everybody that got arrested planned to be arrested,” she said. Lopez said the event’s organizers had discussed their intentions with legal consulstants provided by United We Dream, a youth immigrant-led organization that sponsored the walkout, and that the students should be released within three hours. The event began at 9:30 a.m. when students from GW, School Without Walls and seven other D.C.-area schools walked out of classes in support of Dreamers. At GW, about 100 students poured into Kogan Plaza before taking the Metro to Capitol Hill. 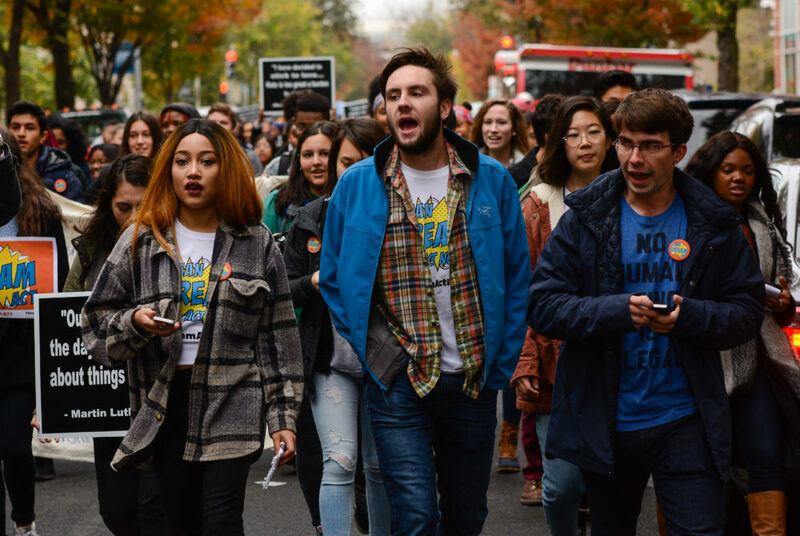 A coalition of at least eight progressive student groups, including Young Progressives Demanding Action, the Feminist Student Union, the GW College Democrats, the Progressive Student Union and Fossil Free GW, organized the walkout at GW. 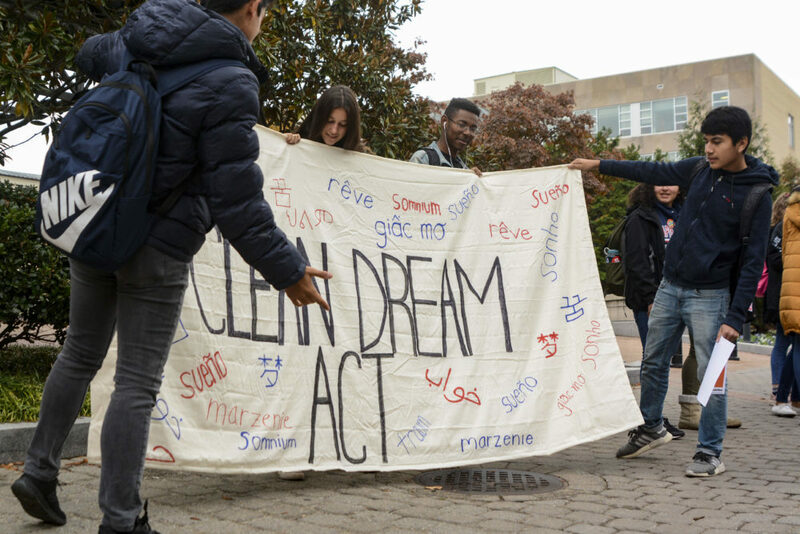 Students unfurled posters demanding Congressional leaders pass a “clean” Dream Act – a bill that affirms Dreamers’ rights without funding immigration enforcement measures like a wall on the U.S.-Mexico border. Activists called for Congress to act before DACA expires in March and young undocumented immigrants are potentially left without legal protections. Students from School Without Walls unveil a sign calling for action from Congress to protect Dreamers. Tsuboi, the chapter leader for Young Progressives Demanding Action, said students organized the walkout because the decision to cancel DACA has created a “dire” situation for undocumented immigrants. She said it’s important for a clean Dream Act to give sweeping protections to not only Dreamers, but also to their parents and families. “You might say that they have it on paper, they might have citizenship, but if you’re taking away their families, taking away their opportunities, if you’re building racist walls, then that’s not really a dream, that’s not really a clean bill,” Tsuboi said. Sophomore Joshua Gomez, a political science major who got involved with the event through Young Progressives Demanding Action, said the walkout would bring attention to the issues undocumented students face and hopefully create lasting change. John Kim, a sophomore majoring in international affairs, said ahead of the walkout Thursday, he revealed to his peers for the first time that he is an undocumented student. Martin Yerovi, a sophomore who legally immigrated to the U.S. as a child, said he attended the walkout because all people arriving in the country should “get the representation that they deserve.” He said DACA protections are necessary because many Dreamers did not choose to enter the country illegally. Laura Muñoz Lopez of Simpsonville, S.C., who joined the protest at the Capitol, said until recently, she was a DACA recipient and her sister is still enrolled in the program. She said the demand for a clean DREAM Act will hopefully change the lives of Dreamers for the better. “I hope that it will, for once and for all, give Dreamers peace of mind to be able to work and go to school and drive legally and not be used as political pawns in this political climate that we’re in,” Lopez said. Due to an editing error, The Hatchet incorrectly reported Keiko Tsuboi’s year. She is a senior. We regret this error.